Looky, I have a search function now --> very handy, and the first thing I used it for was finding my past posts that I needed to catch up linking from my flickr and then I cleaned up my labels a bit. I'm going to clean them up some more so that only featured series are labeled. Really if you are looking for anything, like quinoa recipes, just type "quinoa" in the search box and everything that I wrote about quinoa will pop up. He put glue on the top edge of a stack of business cards, so it's like a business card pad. I mean, it is a business card pad. After the prototype I asked for a bunch of them, so now I have a business card pad in each of my bags. Have I showed you my business cards? These were designed by Lizelle Din of Aesthetic Response a.k.a. Joanie Utah of the Double Crossers a.k.a. my milk toof twin. My favicon is in that font, which is Alte Haas Grotesk Bold, which I am also using in my annotated photos and also the font and the skeleton in some exciting stuff that's coming up in the new year. 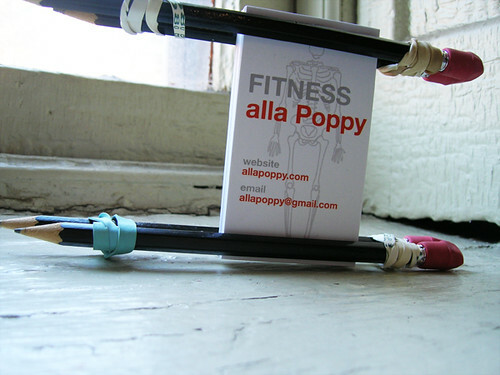 A look and feel for alla Poppy, what! Wait, that sounds dirtier than it means. In a nutshell: I work, I skate, and I sleep. I devise systems to keep myself clothed and fed, which are distantly secondary to me. Actually also, working and sleeping are secondary. So that leaves skating. That was April 2009, though. I threw about a year's worth of spaghetti on the wall, then pulled it all down and rebooted in June 2010 with the same blog description. Now towards the end of 2012, it's probably time for something a little healthier. Food, fitness, and fashion, really in that order, and systems for managing thereof. Well also, I write. Hinc illa blog. I write up charts for my life on a regular basis. I have a taxonomy for dividing my life between work and play, and also sleep, practice, and recovery. I plan my clothes mainly so that I don't have to think about what to wear, and it shows at times. I'm a gear and fitness nerd, and I guess I'm also a nutrition nerd. I used to be a gear nerd, but now not so much. I'm a fitness nerd turned ACE-certified Personal Trainer. Still working out how to write about how to train. Though I also plan my food mainly so that I don't have to think about what to eat. Though in all honesty, the upshot of that is that I'm thinking about what to eat almost all the time. I don't actually think I'm a nutrition nerd? Because eating whole, unprocessed foods means pretty much never having to count calories. I pretty much only bother with recipes that are healthy, tasty, and easy. I'm also a proponent of whole foods. Which means unprocessed and all that, but also And also whole foods means that I will almost always call for an onion or a can of tomatoes and not litter your refrigerator with half-used foods. "State of the blog" is kind of inherently state of the biz, viz., my personal training business, and sort of the first thing to triangulate is the relation of the blog to the biz. Is the blog a biz itself, or is it a function of the personal training biz. Being that after three years of existence the blog has just crested $20.00 in earnings and due to state regulations I'm not even eligible to participate in Amazon's affiliate program, it's not actually that hard to figure out: not a biz. But I think it's an asset for my business, as a resource for my clients and as a marketing piece for prospective clients. But also I am thinking about... Kindle books! The sweetie man is going to help me make those, too. Going on blog break! Be back 12/21.